This bounteous and blooming little planter bears scant resemblance to the one I bought in 2011. Then, it held fewer plants and those looked like mutant worm invaders from a sci-fi epic; I loved it upon sight. 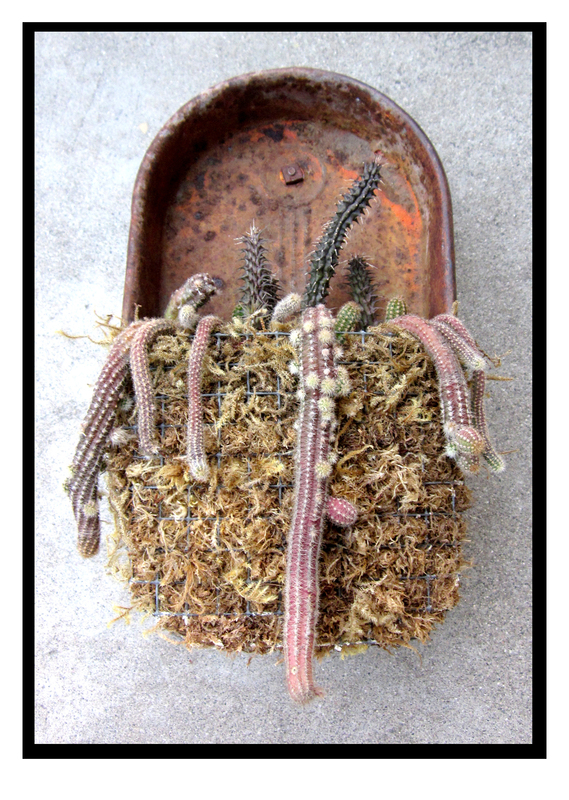 Later I met its maker, artist Vickie Perez, and found that she was expert at transforming rusted toys and other antique items into charming succulent planters. At a sale I hosted, she and husband Tom did very well, selling many of her creations. A post about their home (click here) has done very well, too; to date it’s received almost 1,500 views. And, my photos of Vickie’s pieces have been pinned onto innumerable Pinterest boards. 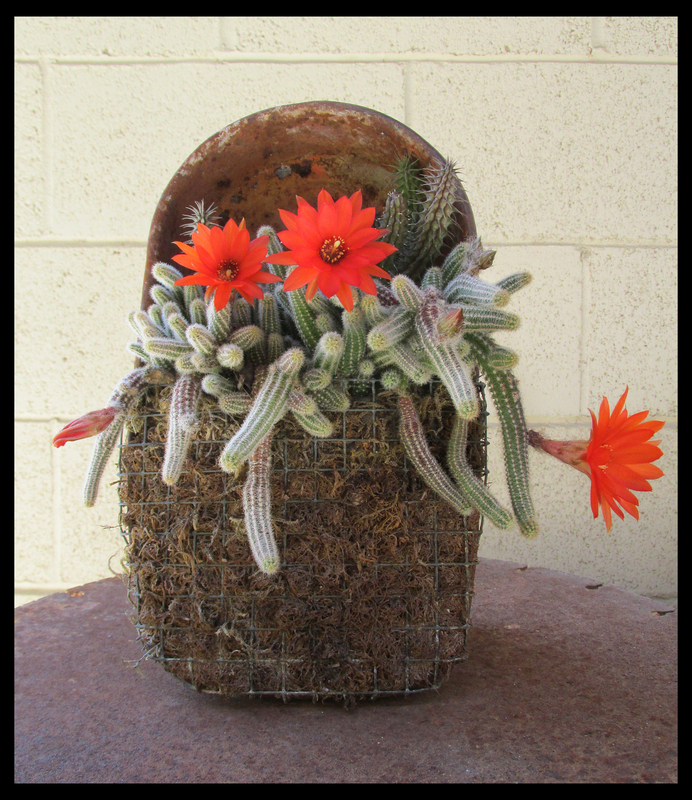 So it really shouldn’t be a surprise that my little rusted toy wagon planter would grow up to be something special … What used to be sparse is now a tumble of finger-sized cactus in bloom for the first time — with blossoms so brightly scarlet their saturation is hard to capture with my point-n-shoot. Also hard to capture: A teeny carrion flower lookalike tucked behind the spiky specimens at top right. It’s dark maroon star-shape refused to be photographed clearly. As the day turns to dusk the large blooms clench shut … until they’re triggered into reopening once again by the morning’s light. As much as I love it today, I can’t resist showing you my little planter as it looked two years ago … simply irresistible. Thanks, Vickie! I am also a big fan of Vickie’s work….I have 6 pieces and they too have been blooming. Hi, Jeanmarie, I remember seeing Vickie’s awesome pitchfork piece at your house and feeling envious! I’m so glad that you and Jeanmarie now see what I knew would come as they grew into themselves. I remember how I felt when I started experimenting with making planters out of some of the toy pieces and such that seem to find the way to my yard. One of my favorite things to do is watching to see what will happen. And am I ever so happy when it works out!Thanks for my surprise when I finally got back online! Just thought of something else…. Can’t remember the name of the plant but am talking about the ornge bloom, some of mine have reached the length of about 21/2 ft this year…. Whoa … Can’t wait for mine to do that, too!